I have never read Miracleman before the current Marvel Comics reprints. I will be here to give you my impression of them as a first time reader as they continue to be released. This issues opens with the two aliens in human form that were inspecting Kid Miracleman. It looks like they are the same kind of aliens that can swap their consciousness in and out of multiple bodies that Miracleman and the others were created from. Now after several decades they have finally arrived on Earth to clean up the mess. We already saw them do a less then thorough job on Johnny Bates so this might no end well. We see them looking into the extra dimensional space where the extra bodies are stored and Mike Moran’s injured human body is still there along with Kid Miracleman and many other curious looking forms. The aliens later go to a doctor’s office for some reason. And it looks like the doctor has abilities like Miracleman and flees. I have a theory who this woman is based on what little knowledge I do have of the Miracleman storyline. The aliens then go to South America and find the dead Miracledog. Finally they decide its time to introduce themselves to Mike Moran. 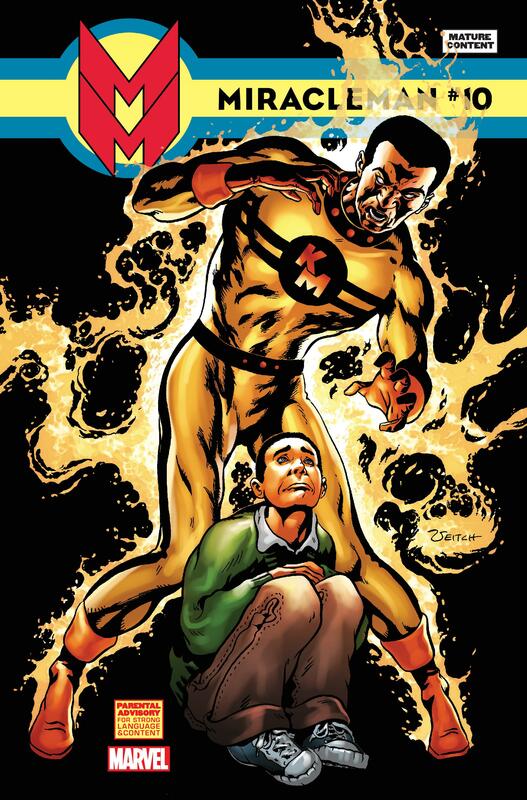 Speaking of Mike Moran and his family, Miracleman finally changes back into Mike. Liz is having a hard time with the new baby because she is clearly not normal. She never cries and seems to be eating much more than a normal baby. Liz talks about how she was much more calm when she was pregnant and suddenly she starts feeling happy. It had been set up that the baby, named Winter, has powers inherited from Miracleman and it looks like she is now using those powers to affect her mothers mind and make her happy. Also the large quantities of food she is eating suggests she is growing at an abnormal rate. Towards the end Mike is looking at Winter in her crib and notices something disturbing, she already has teeth. And in one of the last panels it looks like she might be biting off Mike’s finger. Finally we get a brief look at Johnny Bates again. Kid Miracleman is still tormenting him in his mind when Johnny decides to stand up to him and begins coming out of his coma. At the end Kid Miracleman has a smile on his face. So either he was manipulating Bates the whole time or maybe at the last moment he just realized he could use Bates new backbone to is advantage. I think we are getting closer and closer to one of the bigger and more gruesome events of the Miracleman story that I have heard about.